Advocate helps litigators to prepare evidence, build an overview and present key facts of a case to all parties achieving the best outcome in a timely manner. Providing your client a clear understanding of the facts of their case helps to manage expectations, and for the other side, and the court, you get to share the powerful evidence and facts of the case that you have built up, presented as you see it, comprehensive and organised. How does Advocate work with LEAP? 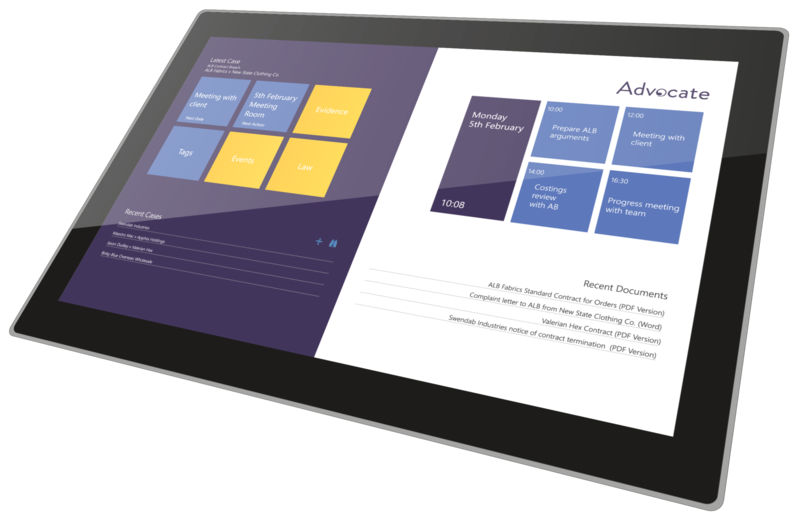 LEAP’s integration with Advocate, the digital case preparation and presentation system allows litigators to access their client and matter information from within the Advocate solution. Evidence Collection and Markup: Simple to use and providing greater ease of reference than pen and paper, Advocate’s cutting-edge technology delivers litigators outstanding flexibility, and encourages a more methodical, precise and focused way of working. Links and Tags: The Advocate ‘quick link’ system is digital sticky notes that never let you down. You highlight the important information and create a link that will take you straight back to the right place in the right document fast and without fail. Generate instant reports, pleadings, timelines, chronologies and word clouds. Timelines and chronologies: Built automatically for you within Advocate, timelines and chronologies are developed from events with dates attached. Mitigation Pleas: Access full details of over 1,000 offences so you can build sentencing hearing presentations properly guided by the relevant sentencing information.